We are expert installers of everything from Twisted Pair Ethernet to fiber backbones. Whatever your needs Ohio TeleCom has the experience and equipment to build reliable network infrastructure Network Cabling Cat7a Cat 7a – We guarantee it! A major revision, Edition 3, has been released in November 2017, unifying requirements for commercial, home and industrial networks. Class F channel and Category 7 cable are backward compatible with Class D/Category 5e and Class E/Category 6. Class F features even stricter specifications for crosstalk and system noise than Class E. To achieve this, shielding has been added for individual wire pairs and the cable as a whole. Unshielded cables rely on the quality of the twists to protect from EMI. This involves a tight twist and carefully controlled design. Cables with individual shielding per pair such as category 7 rely mostly on the shield and therefore have pairs with longer twists. 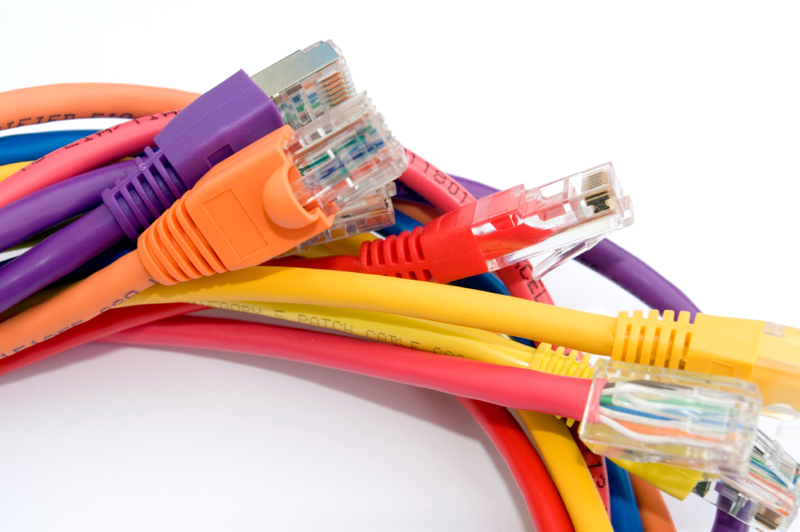 The Category 7 cable standard has been ratified in 2002 to allow 10 Gigabit Ethernet over 100 m of copper cabling. The cable contains four twisted copper wire pairs, just like the earlier standards. Category 7 cable can be terminated either with 8P8C compatible GG45 electrical connectors which incorporate the 8P8C standard or with TERA connectors. When combined with GG-45 or TERA connectors, Category 7 cable is rated for transmission frequencies of up to 600 MHz. As of 2017 there is no equipment that has connectors supporting the Class F (Category 7) channel. Class II channel (Category 8.2 cable): F/FTP or S/FTP minimum, interoperable with Class FA (Category 7A) using TERA or GG45 connectors. In November 2017, Edition 3 was released by ISO/IEC JTC 1/SC 25 “Interconnection of information technology equipment”. It is a major revision of the standard which has unified several prior standards for commercial, home, and industrial networks, as well as data centers, and defines requirements for generic cabling and distributed building networks. Hansen, Carl G. (November 2010). “10GABSE-T for Broad 10_Gigabit Adoption in the Data Center”. Ethernet Alliance November 2010. “Researchers push transmission rate of copper cables”. News release. Pennsylvania State University. November 14, 2007. Archived from the original on February 22, 2012. Retrieved July 9, 2011. Rick C. Hodgin (November 14, 2007). “UPDATE: Cat7a copper theorized to transmit 100 Gbit/s in excess of 100 meters (328 ft) using future modems”. TGDaily blog. Archived from the original on August 3, 2009. Retrieved July 9, 2011. Flatman, Alan (2013-05-16). “ISO/IEC TR 11801-99-1: Guidance on 40GBASE-T Cabling -a tutorial-” (PDF). Retrieved 2014-01-26. “Standards – ISO/IEC JTC 1/SC 25 – Interconnection of information technology equipment”. ISO.org. Retrieved 2016-10-02.
International Organization for Standardization. “Interconnection of information technology equipment”. International Organization for Standardization. Retrieved 23 January 2018.